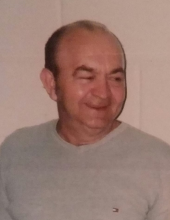 Everett “Pete” Johnson, age 70 of Wheelwright, Kentucky, passed away on Saturday, March 16, 2019 at Hazard ARH, Hazard, Kentucky. He was born March 20, 1948 in Floyd County, Kentucky to the late Frank & Anna Mullins Johnson. He was the husband of Rosie Branham Johnson. He was a coal miner and of Freewill Baptist Faith. Along with his wife he is survived by his Sons: Randy (Rose) Johnson of Bevinsville, Kentucky, Steven (Barbie) Johnson of Wheelwright, Kentucky & Mark Johnson of Wheelwright, Kentucky; Daughters: Brenda (Mike) Tackett of Wheelwright, Kentucky & Mary (Robert Ford) Johnson of Prestonsburg, Kentucky; Brothers & Sisters: Donald Johnson of Columbus, Ohio, Teddy Newman of West Virginia, Ann Marie Johnson of Las Vegas & Joann Johnson of Virginia; 15 Grandchildren & 13 Great Grandchildren. Along with his parents he was preceded in death by his Son: Charles Johnson; Brothers & Sister: Bob Johnson, David Johnson & Helen Johnson. He will be missed by all that knew and loved him. "Email Address" would like to share the life celebration of Everett "Pete" Johnson. Click on the "link" to go to share a favorite memory or leave a condolence message for the family.